Sometimes you don’t want all the visitors to view some of the posts. That’s when you might need to protect the post with a password. From this tutorial you’ll find out how to protect posts using password. 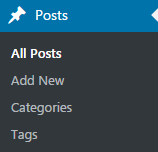 Proceed to Posts tab in the left column. Choose All Posts sub menu. Click on Edit link under the post which you want to protect with password. Change visibility settings in the Publish block located in the top right corner. 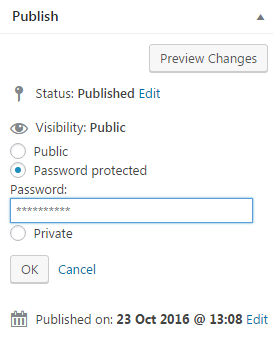 Enable Password Protected option and input the password you want to use. Click on OK button, and then update the post. Now your post is protected with a password. One needs to type in the password to view it.